If you’ve visited the Center for Creative Connections (C3) within the last week, you may have noticed that the popular Art Spot is currently under construction. In addition to this redesign, we’re also installing a new work of art and related activity. Often when we plan these types of activities, we begin with the work of art as inspiration. This time, however, we started with the activity and found a work of art that fit. Last summer during our July Late Night we hosted a drop-in program in the C3 Studio where visitors participated in a communal grid enlargement project. As visitors entered the studio they received a small image square and a larger blank card. Their task was to paint the image from their square onto their blank card and then display their painted card on a large grid in the back of the room. Over the course of the evening, the identity of the two paintings were revealed as visitors completed their cards and added them to the wall. The activity was such a success that we decided to recreate it in the C3 gallery this summer. The question was, which work of art to choose? We had a few ideas that guided our decision. First, since this is an enlargement activity, we were looking for a relatively small work of art. Also, since the activity takes place in the gallery, visitors will be limited to using colored pencils, so we wanted a work of art that demonstrated that kind of mark-making. Originally we considered a drawing, but after consulting with our registrars, we found that lithographs or engravings might also be a good option. Finally, subject matter was of great importance; we wanted something bright and lively. 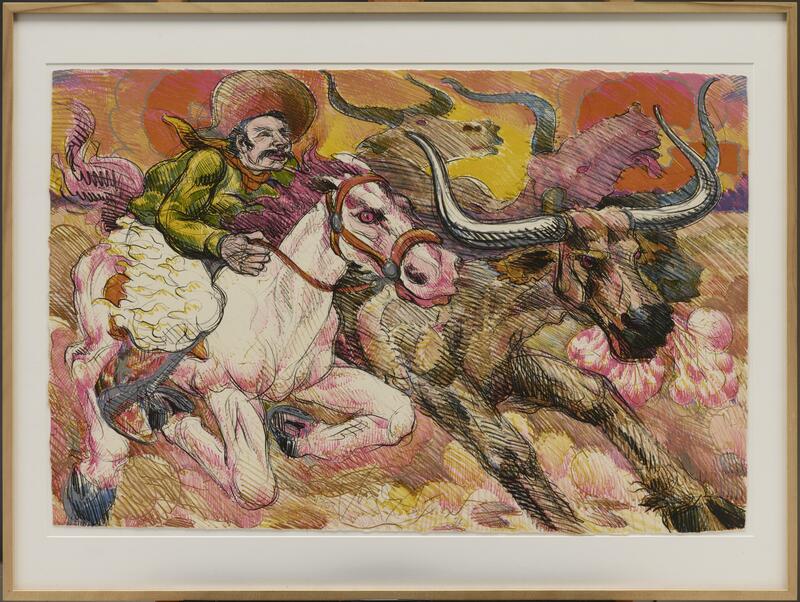 All of these specifications led us directly to Progress Suite by Luis Alfonso Jimenez, Jr.
Progress Suite exemplifies all of these qualities: it’s a colorful dynamic lithograph created by a Texas-born artist, measuring 23.5 inches x 35 inches. It will be enlarged by visitors to 300% of its original size. This mock-up illustrates just how large the activity will be. Throughout the summer, as more visitors participate, the drawing will grow and evolve. Stop by the Center for Creative Connections to contribute to our scaled-up reproduction of Progress Suite and watch how this “living” drawing, made by our community, changes over time.